This is a follow-up to my last post and this time, I’ll address the implied correlation between freeze-up dates for Hudson Bay and Churchill temperatures in November that is being made by folks who should know better . Well, that may be true for the last few years – the high on 14 November 2016 (-1.20C) was the highest since 2012. Derocher is being unscientifically vague here and also misleadingly cites highs and lows as if they were the same. In fact, according to weather records kept by Environment Canada, for 4 November 2016 at Churchill, the daily high was +1.50C (compared to –1.50C in 2015). The daily low in 2015 was -15.30C, a 10 degree difference. The next-highest temp. for that date since 2012 was +0.70C in 2014 – hardly an earth-shattering difference. However, if you are trying to draw conclusions about climate, you should go back at least 60 years (two climate periods of 30 years each). Temperature records for Churchill go back to 1943, which can be used to assess the claim for the 14th of November made by PBI. The final recorded max. for yesterday (Thurs. 17 Nov) was -9.70C vs. a min. of -17.70C. So, a bit warmer during the day than predicted but as cold as expected overnight. And for today, the current temperature in Churchill, as I write this is, is -190C (-310C with the wind chill) and the year with the highest temperature recorded for 18 November was 1944 (0.00C) – which was also the highest temperature for the 19th, recorded in 1943. Ice maps and historical background below. See last post for recent multi-year comparison. Guess which year between 2006 and 2016 had the latest start to freeze-up on Hudson Bay, given that 2012 had the lowest September average and 2007 and 2016 tied for second-lowest (see graph below, from NSIDC), and that sea ice in the Arctic right now is the lowest it’s been for this date since 1979? If you guessed anything other than 2010, you guessed wrong – in addition, 2006 (not 2016) was second latest. There is no correlation between Arctic sea ice coverage and freeze-up dates for Western Hudson Bay. They also claim that “…the weather is the warmest we’ve ever seen at this time of year.” That may be true, but if so, it is also meaningless with respect to the progress of freeze-up. Does no one at PBI remember the very late freeze-up of 2010 or 2006? Odd, that. Viewers outside the UK can now watch polar bear scientist Steve Amstrup live (Episode 2, filmed 2 November 2016), state that there are “20,000-25,000” polar bears in the world, almost a full year after the IUCN Red List put the worldwide polar bear population size at 22,000-31,000. 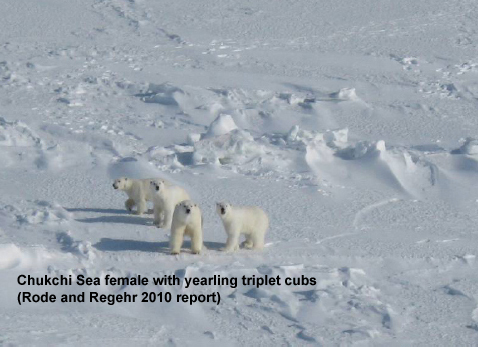 Watch Steve Amstrup, live (Episode 2, filmed 2 November 2016) state that sea ice is only “usually” present in March/April when females with cubs emerge from their dens to feed – as if there has ever not been sea ice present at this critical time of year! Watch Amstrup , live (Episode 2, filmed 2 November 2016) not point out that the prediction he was responsible for making in 2007 (that got polar bears listed as ‘threatened’ in the USA) has been a total failure: even though the USGS models predicted that polar bear numbers worldwide would decline by 67% and Western Hudson Bay polar bears (as well as nine others) would be wiped out completely when summer sea ice reached the levels they’ve been at since 2007, he pretends that prediction was scientifically valid. We’ve had sea ice levels not predicted to occur until 2050 for 8 out of the last 10 years and polar bears are still going strong. If Amstrup had been right about the relationship of summer sea ice and polar bear numbers, there would have been no polar bears in Churchill for the BBC to film this year. Watch all three hour-long episodes below as these two organization team up to promote fear of future global warming with polar bears (or polar bears, as Humble says it). Decide for yourself if polar bear science is being fairly represented. Polar bears in virtually all regions will now have finished their intensive spring feeding, which means sea ice levels are no longer an issue. A few additional seals won’t make much difference to a bear’s condition at this point. A new peer-reviewed report (Rode et al. 2014 [in print] 2013, accepted), released last month (announced here), documents the fact that polar bears in the Chukchi Sea are doing better than virtually any other population studied, despite significant losses in summer sea ice over the last two decades – even though the Polar Bear Specialist Group (PBSG) said this population was declining (Obbard et al. 2010). Rather than this good news being shouted far and wide, what we’ve seen so far is a mere whisper. The strategy for suppressing the information appears to have several parts: make it hard to find; don’t actively publicize it; down-play the spectacularly good nature of the news; minimize how wrong they were; keep the focus on the future. Something similar happened with the newly-published paper on Davis Strait bears (Peacock et al. 2013, discussed here and here) but the news there wasn’t quite so shockingly different from expected. The suppression of good news stands in marked contrast to anything with a hint of bad news, which gets reported around the world — for example, Andrew Derocher and colleagues and their “prepare now to save polar bears” policy paper in February, 2013. US Fish & Wildlife biologist Eric Regehr, co-investigator of the Chukchi study and co-author of the newly-published report, wrote an announcement about the paper. It wasn’t a real press release, since it was not actually sent to media outlets. It was a statement, with a brief summary of the paper, posted on a regional US Fish & Wildlife website, with no mention of lead author Karyn Rode. Not surprisingly, lack of active promotion = no media coverage. The posted announcement also down-played how well the Chukchi bears are doing. In fact, the news documented in the paper is much better than any of them let on: Chukchi polar bears are doing better than virtually all other populations studied. But Regehr also had to do some damage control to counter the evidence this paper contains of how wrong they had all been — not only about the Chukchi population today but about their predictions for polar bears in the future. After all, the computer models used to predict a dire future for polar bears combined the Chukchi Sea with the Southern Beaufort, as having similar ice habitats (“ice ecoregions”). The published paper and Regehr’s statement now say these two regions are very different and that polar bear response to loss of sea ice is “complex” rather than a simple matter of less summer ice = harm to polar bears. Regehr goes on to say that polar bear scientists expected this would happen. I call total BS on this one, which I explain in full later (with a map). Finally, Regehr’s statement emphasizes that good news for 1 subpopulation out of 19 today should not be celebrated because the overall future for polar bears — prophesied by computerized crystal balls — is bleak. Focus on the future, they say. Did they forget that for years they’ve been telling us that polar bears are already being harmed and that this foreshadows what’s to come? Now we have the results of yet another peer-reviewed study showing bears not being harmed by declines in summer ice (see the full list here). So, in the end, all of this double-talk and contradiction is not just about suppressing this particular paper. There’s much more at stake. The Rode et al. Chukchi paper is strong evidence that their predictions of a grim future for polar bears – based on theoretical responses to summer sea ice declines that should already be apparent – have been refuted by their own studies. It’s no wonder they want to keep the media away from this story. In 2009, for the first time, the polar bear biologists that make up the IUCN’s Polar Bear Specialist Group (PBSG) invited four professional advocates – not one or two, but four – to their exclusive, once-every-four-years meeting of top polar bear biologists (called “delegates”) from the world’s Arctic nations (Canada, Russia, USA, Greenland/Denmark and Norway) – two from World Wildlife Fund (WWF) and two from Polar Bears International (PBI). In that post, I mentioned that there was an “exclusive members-only meeting” scheduled for October 24-27, 2013. Well, I just came across a notice on the PBSG website that tells us what went on at that meeting. The Polar Specialist Group (PBSG) voted unanimously to embrace World Wildlife Fund activist Geoff York and Polar Bears International activist Steve Amstrup as delegates with full voting rights until 2016. This is a first: never before have employees of activist organizations been made full member-delegates of this formerly exclusive organization. With this move, the PBSG are telling the world that they are an advocate association first and a scientific organization second.